After the first break Wolf Blitzer, CNN pundits and a panel reported and discussed the ACA numbers released today. Wolf also promoted a report he would be doing on Toronto's crack smoking mayor. Really CNN? You couldn't devote one hour to Anderson's field reporting from the Philippines? And I did a head desk at the amount of time Wolf spent on Toronto's mayor? From good field reporting on a natural disaster to a story best left to the tabloids gave me whiplash and I hit the FF button. Anderson closed the program and thanked viewers for watching. I'm heartbroken for what's happening in the Philippines, but I'm so glad to see Anderson tell this story. This is the type of work that he does that I admire the most. Thanks, ATA, for posting videos of the first segment. I missed most of it when it was broadcast, came in during Paula Hancock's time. How many are getting feelings of deja vu of New Orleans/Gulf Coast after Katrina when watching Anderson in Tacloban, Philippines? Some of the scenes, some of the phrases from Anderson and other reporters are eerily similar. 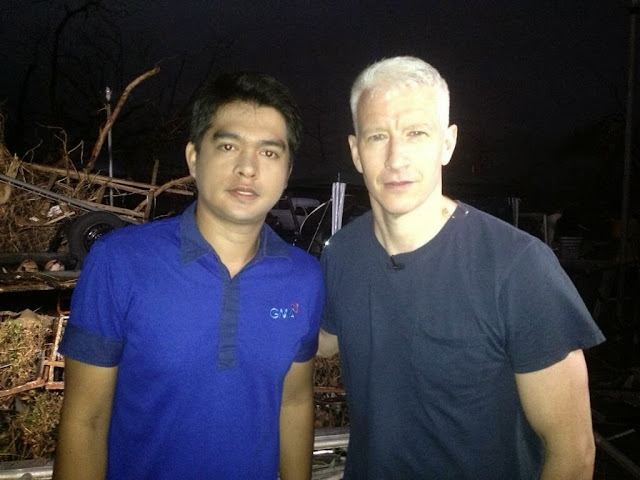 It's Anderson, his crew and the other reporters doing a fantastic job under horrendous circumstances. And there's also the same problem of getting the aid, the right supplies, distributed in an orderly manner to the right people. The logistics of this just must be mind-boggling. Although I didn't like it, I wasn't surprised by Blitzer's Obamacare segment in the show. The ACA enrollment numbers were released today and CNN (not Anderson) had to say something about those numbers in the 8 pm hour. The panel had a new face - Peter Beinart - someone I don't know and Begala and Borger. They all re-hashed points we've heard already ad nausea. The only new point was Beinart's; concerning the poor who really needed ACA are not as vocal or politically active as the people who had their insurance policies cancelled. However, during this segment the best information came from the subtitles on the screen. The one with the most airtime was "Only 26,793 Americans selected a plan through healthcare.gov" but the best one stated the TOTAL number who have signed up for ACA, which is 106,185 and another stating 79,000+ signed up on their state sites. 106,185, I know a couple of those people. I did not watch the segment on Mayor Rob Ford. Anderson's report on the military handing out aid and his time with them plus trying to give an update on one of the survivors he met yesterday was the best segment of the night. Besides Anderson and the other reporters discussing the difficulty in getting aid to everywhere it's needed, there also should have been on-screen information of where to send a donation. I know the info is probably on the AC360 website but it would really help to put that info on TV. After watching Anderson's excellent field reporting from Tacloban, I wasn't in any mood to see studio reports on ACA or Toronto's mayor--I guess CNN's audience can't handle too much 'foreign' news taking up their time, so they had to throw in another pointless panel. I didn't bother to watch that part of 360. It's interesting to read the comments on Twitter from Filipinos about AC's reporting and how it stacks up against the Filipino reporters covering the disaster--most people seem to think that AC is doing a good job pointing out the government's inadequacies and some (including a reporter) thinks he doesn't know what he's talking about. He's right there on the scene, reporting exactly what he sees and it's hard to argue with what he says. I also hope AC finds the man who lost his wife and children--his oldest daughter is still living and I hope he can hang on for her. I understand that the people of and who work for the government may also be severe victims of the storm, but at the same time there & that should be a good reason to have a firm set in stone emergency plan. They are living on an island, they know these kinds of storms are more than probable they should be as efficient as Japan was in acting quickly but I guess their government is still running along the old lines of the MegaloMarcos state of mind. Is it just me recognising this or is Anderson wheezing terribly when he breaths in while talking and has been doing so since around the Haiti quake?? in the Philippines. Perhaps he's lost his touch from sitting in front of the teleprompter for the past two years. Anderson was critical of the Phlippine government's slow response and this infuriated a foreign journalist who is married to the interior minister. I find it quite odd that Anderson continues to stick his neck out when it comes to "OTHER" gov't agencies. Yet when it comes to our own Administration...he couldn't be more demeaning, or complimentary to the opposition. He also made some comment about a costume that had to do with a Peruvian celebration, and was told by a journalist, "Cooper doesn't know what he's talking about." Since AC did this on his always ridiculous, Ridiculist: I say, Amen.